Data protection and international privacy compliance are important. 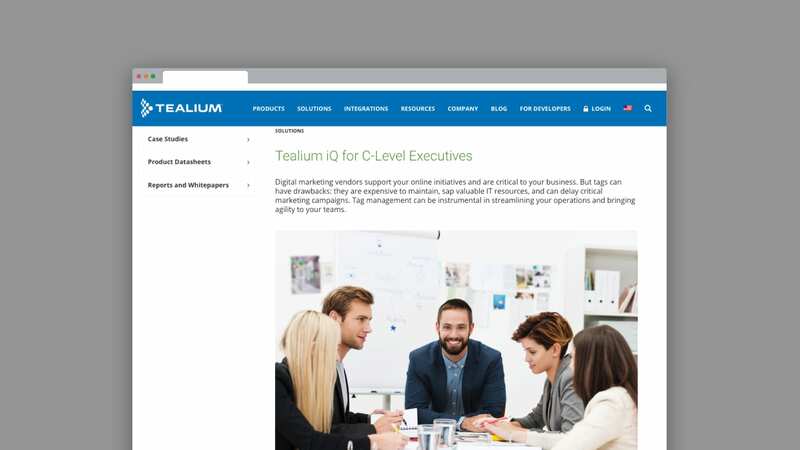 The Tealium iQ tag management system provides precise control over the data and the practices surrounding your vendors. Unmanaged tags represent a potential risk, as marketers rely on the data they collect to gather rich information about visitors, and use it to improve their browsing experience. Unmanaged tags can make it difficult to control the exchange of potentially sensitive information, and may not always comply with the latest privacy protection standards and regulations. Tealium iQ supports geographic based privacy compliance, and enables enterprises to become instantly e-privacy compliant on a global scale in minutes. The Tealium iQ privacy widget provides control and flexibility for offering opt-in or opt-out choices to your online visitors. Use the Tealium iQ privacy widget to give site visitors total control over which tags or cookies they want to accept while they visit your site. Have a global web presence? Some countries have very specific laws for what information enterprises can collect about their online visitors, and what sort of choices must be allowed. This can be a headache for digital marketers who have dozens of tags collecting data, all of which must be compliant with local in-country privacy regulations. Tealium iQ supports geographic based privacy compliance, allowing organizations to apply standards by country and giving precise control over the data collection practices of each vendor. Your data is gold, and tag vendors want to get their hands on it. Tealium iQ lets you control which vendors get access to your data. Some third-party vendors collect sensitive data that you may not have authorized, and often times you aren’t sure how that data is being used, or shared. Tealium iQ keeps you in the loop, allowing you to audit the data collection practices of each vendor tag, and control the data collected. Alongside controlling online vendors, Tealium iQ offers insight into how tags are operating—from page location to internal ownership—on all of your web pages. One of the biggest challenges in the enterprise is trying to standardize digital data definitions across vendors. Most online vendors collect and define data based on their own unique syntax. Tealium iQ lets you define the data once, and the data is automatically standardized across your digital vendors. This removes the limitations of only exposing data to vendors in their nomenclature, and makes it easy to correlate the data from different tags into an actionable source. Tealium supports the Do Not Track (DNT) feature within new browsers, so that even if your digital marketing vendors do not support this mechanism, you will still be in control.